Grinder prevents maintenance of downstream equipment. Self-contained Pipeliner(TM) Grinder eliminates ragging in secondary and tertiary sludge applications. Single-shaft unit features tungsten carbide adjusting cutters, spring-loaded cutter assembly that maintains constant force against shearplate, on-site cutter replacement without disconnecting piping, and single mechanical seal with silicon carbide faces. Standard shearplate hole is 15 mm, with optional hole sizes of 6, 8, 10, and 20 mm available. Springfield, Ohio - Moyno® Pipeliner(TM) grinder prevents expensive maintenance of downstream process equipment by eliminating ragging in secondary and tertiary sludge applications. The Pipeliner provides an effective solution to the disruptive, time consuming problem of inconsistent particle size frequently associated with handling solids in wastewater treatment processes. This self-contained solids reduction unit minimizes clogging and shortens mixing and filtration cycles. 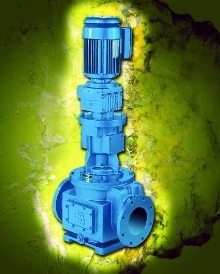 Moyno, Inc. is a leading manufacturer and marketer of Moyno progressing cavity pumps, multiphase fluid transfer systems, grinders and controls. It has an extensive worldwide stocking distribution network that serves a wide range of industries including water and wastewater treatment, pulp and paper, chemical, food, pharmaceutical, mining, petrochemical and oil and gas recovery. Moyno, Inc. is a unit of Robbins & Myers, Inc.